These Brown Butter Pancakes have the delicious flavor of browned butter. This recipe uses a simple pancake batter with the addition of browned butter. This recipe for brown butter pancakes can be made without browning the butter and they’d still taste great! Going a little further with these pancakes and making them with brown butter kicks the flavors up a notch and gives the pancakes a nutty and more intense flavor than regular butter. You start making these pancakes by browning the butter for the recipe. By doing this first, you ensure that you won’t be rushing the butter to cool down. The trick to making browned butter is to approach is slowly – it should only take about 7 minutes to get the browned bits to start forming. After the browned bits are formed, it goes rather quickly. It’s important to have a heatproof bowl readily available to remove it from the hot skillet. If you don’t remove it quickly, it will burn. Have the heatproof bowl on standby! TIP: It’s important to add the flour slowly to the mixture and to use a spoon to mix the ingredients. If you use an electric mixer to mix the batter too quick, your pancakes will come out flat and they won’t be airy. To make these pancakes I used my griddle because it is so much faster than making one pancake at a time on a non-stick skillet. Either way is fine but my family gets impatient when they know I’m making pancakes for breakfast or for dinner so using a griddle definitely makes the process much speedier! I used a 1/4 measuring cup to make these pancakes and I was able to get 10 nice sized pancakes out of it. You can easily double this recipe, too! Easy to make classic fluffy pancakes made with browned butter. Brown the butter by melting it in a small skillet over low heat. Gradually bring heat up to a medium-low and stir frequently. The butter will start to look frothy and small bits of brown will start to form. Keep stirring until the butter has a nice caramel look to it and immediately pour the butter into a heatproof bowl. This is extremely important because it will burn if it sits in the skillet. Allow the butter to cool down before adding it into the pancake mix. Heat griddle or non-stick pan to medium heat and grease lightly. In a medium bowl, stir together the cooled down butter and the sugar. Add in the baking powder, baking soda, and salt. Using a spoon to stir, add in the milk and flour by adding half each at a time. Make sure not to overbeat the mix, it will make the pancakes flat. The batter will be a bit lumpy, it is fine - just make sure the ingredients are mixed in. Test griddle or non-stick pan by spritzing water on it. If it sizzles, the pancakes are ready to be added. Add 1/4 cup of batter to the griddle or pan, let it sit for about 1 minute. Bubbles should form and pop. Flip pancakes and heat for another 30 seconds to 1 minute longer. Ooooo this recipe resonates with me! I love brown butter, it just elevates every recipe and takes so little effort once you master it. 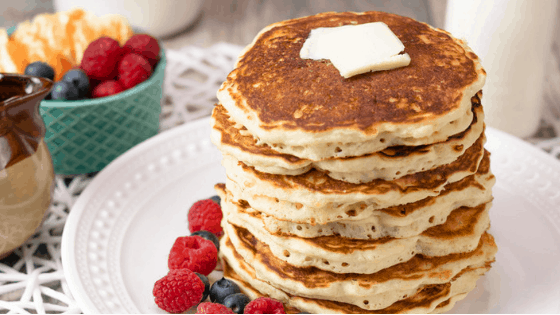 I bet these pancakes taste lovely – I love having breakfast for dinner sometimes, you definitely have inspired an evening meal for this week!